This show was broadcast on August 13, 2014. Danny Schechter: Israel is bad for the Jews! 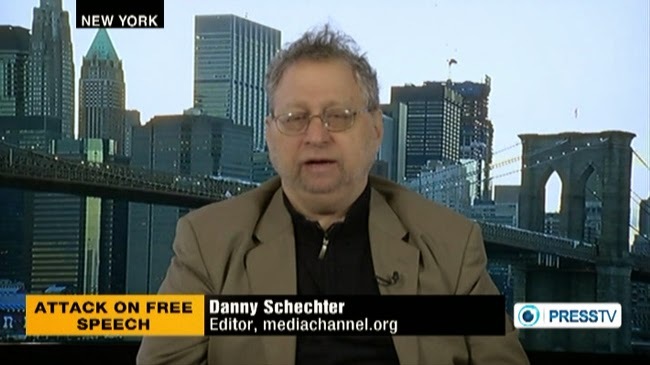 Danny Schechter “The News Dissector” is one of America’s leading media critics. Though he’s Jewish himself, he is now being called an anti-Semite, a Jew-hater, a Nazi – you know the drill – because he dares to speak out about the “Big Lie” (Chris Hedges) of Israel’s propaganda narrative…and the fact that Zionist Israel is worse than apartheid South Africa (Chomsky). In this interview we argue a little bit but stay generally good-humored and congenial. As a former mainstream media insider turned whistleblower and critic, and a principled American Jewish voice with an acerbic sense of humor, Danny brings a much-needed perspective to this topic. Israel Is Bad for The Jews, Part 2. This entry was posted on Monday, August 11th, 2014 at 8:18 pm	and is filed under Anti-War, Censorship-Propaganda, Freedom, Justice, Kevin Barrett, News, Occupation, Protest, War Crimes. You can follow any responses to this entry through the RSS 2.0 feed.